What do you get when you put together forest policy experts from 16 different European countries and the European Commission with scientists and forest practitioners? Lively and insightful discussions, determination to find new solutions and, of course, outings in the forest. The kick-off meeting of the European network “Integrate” took place in Bonn, Germany, on 26-27 June. Hosted by the Federal Ministry of Food and Agriculture of Germany (BMEL), the Ministry of Agriculture of the Czech Republic, and facilitated by EFI’s Bonn office, the event attracted about 50 participants interested in the exchange of ideas relating to the need for successful integration of nature conservation into sustainable forest management across Europe. The foundations of the European “Integrate” network were laid by the lessons learned and outcomes of EFI’s former projects INTEGRATE/INTEGRATE+ funded by the BMEL. These projects explored the scientific basis for integrating nature conservation into forest management, and established a European network of demonstration sites for integrated forest management. The European Integrate network aims to enable cross-border and cross-sectoral learning related to integrated forest management at the policy level, offering an active interface between policy and research. The kick-off meeting started with an opening from Matthias Schwoerer from BMEL, Tomas Krejzar from the Ministry of Agriculture of the Czech Republic and Georg Winkel from EFI. The subsequent keynote presentations gave light to some examples of integrating nature conservation into sustainable forest management in Germany and Poland. They also provided insights from research regarding the possibilities, but also challenges, to implement integrated forest management in practice. 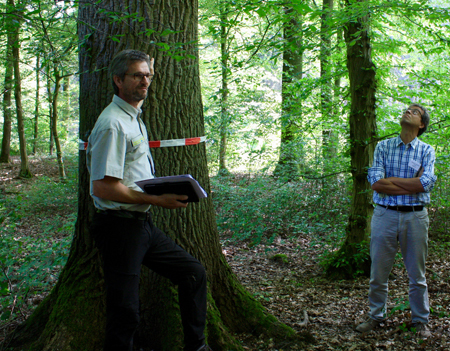 Participants visited forest areas near Bonn to get first-hand experience with a Marteloscope plot, installed as part of the INTEGRATE/INTEGRATE+ project. The second day allowed participants to find out more about challenges of and possible solutions for integrated forest management in different European countries. Three research projects conducted by EFI’s Associate Members on integrated forest management were presented: the ConFoBiproject (University of Freiburg), the InFormed project (led by INRA), and oForest (led by the Swiss WSL). EFI Bonn’s new project InForMAr (Integrated Forest Management Learning Architecture), was also presented. InForMAr aims to build and maintain a transnational learning architecture between scientists, policy makers and practitioners with regards to integrated forest management and to understand the current and future ecological, socio-political and economic driving forces related to this approach at a European scale. From plans to action – what’s next? The participants expressed their appreciation for the event and their interest in continuing the European Integrate Network initiative. The Czech Ministry of Agriculture offered to conduct the next meeting of the Network in 2018 in Prague. EFI Bonn will provide scientific support and facilitate further activities of the network with its InforMAr project, thus contributing scientific knowledge to an ongoing exchange of European policy experts on the integration of nature conservation into sustainable forest management in Europe.